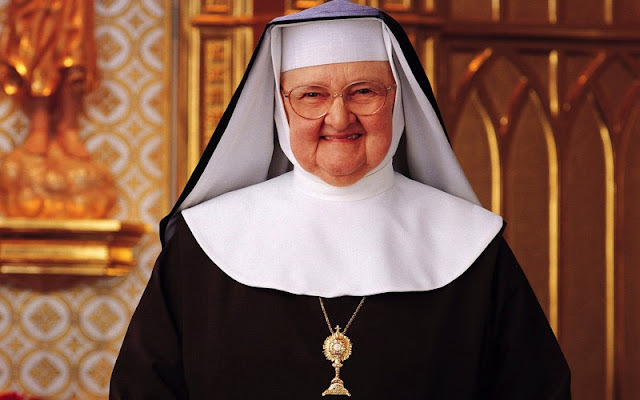 Anniversary of the death of Mother Angelica, the founder of the Eternal Word Television Network who died on Sunday, March 27, 2016 at the age of 92. This is due to the "after effects of a stroke." “Mother has always and will always personify EWTN, the network that God asked her to found,” was the statement released by EWTN Chairman Michael Warsaw. Mother suffered a severe cerebral hemorrhage on Christmas Eve 2001 from which she never fully recovered. She was born with the name Rita Rizzo in Canton, Ohio, in 1923. Rita then entered the Poor Clares of Perpetual Adoration monastery in Cleveland at age 21. However she opened a new monastery in Alabama in 1962. History was made when with only $200, she began broadcasting a religious talk show from a TV studio at the monastery in 1981. EWTN Catholic Network TV networks reach over 258 million households in over 145 counties. The National Catholic Register newspaper, and the Catholic News Agency both belong to EWTN. The nonprofit organization received $46 million in 2013 nearly all from donations. Father Frank Pavone the National Director of Priests for Life said “We have all lost a friend, a mentor, a spiritual mother, a voice of conscience, and a source of laughter and encouragement.” “I was able to thank her again personally for all she has done when I said Mass in her room just two weeks ago on March 13th and blessed her with a first class relic of Pope Saint John Paul II.” The Bishop of Birmingham n Alabama Robert J. Baker, also released a statement on WBRC-TV, "Mother Angelica brought the truth and the love and the life of the Gospel of Jesus to so many people, not only to our Catholic household of faith, but to many thousands of people who are not Catholic, in that beautiful way she had of touching lives, bringing so many people into the Catholic Faith." May she Rest in Peace.